Several interesting classic dinghies are up for offer at the on-line marine auction being run by Graham Cockle Consultancy from the 11 to 26 January 2019. A particularly interesting item is Lot 5, an early International 14 of 1933. Lightning (#290) is a design/build by Uffa Fox for John Winter, who won the Prince of Wales Cup (POW) in her the following year and then took three second places. Winter then famously joined with Peter Scott, who had won the 1937 POW in Thunder (#388), to have a new boat, Thunder & Lightning (#409) built, in which they used the first trapeze rig to win the 1938 POW. The trapeze was then banned by the class, but Winter and Scott returned to win again, without a trapeze, in the first POW after WWII in 1946. There is also another POW winner available. Lot 2 is an International 14, Harrier (#1106) a Bruce Kirby design of 1979 in GRP, which Mike Peacock used to win the 1979 POW. 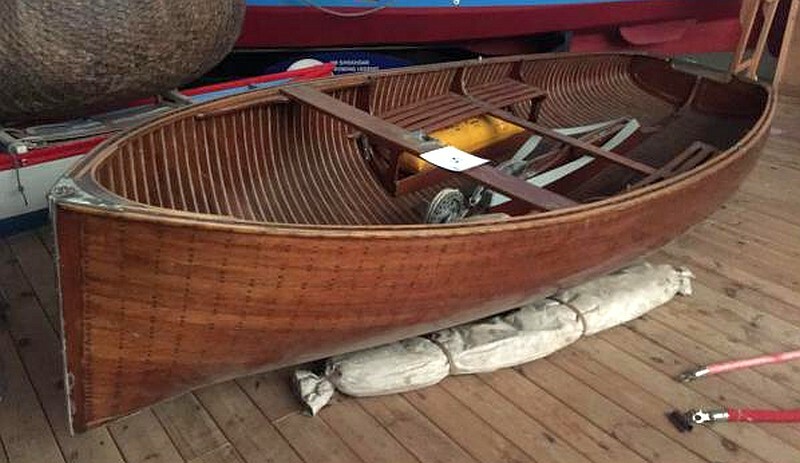 Among the dinghy and marine equipment on offer is an early Finn class dinghy K88, built by Fairey Marine which looks in good condition and is complete with wooden mast and a sail. Lot 8, is an early a Merlin Rocket (#457) of clinker/rib construction, possible built in the early 1950s, which looks more of a project. Other classic sailing dinghies on offer include: an 11 Plus dinghy, built by Dobson of Derby and a Firefly dinghy project, with a black hull complete with mast and sails. Marine Auction – Going, Going . . .